pretty good for an ips panel, I've had it for quite some time now. It's not that great for gaming, but it's awesome for movies due to the 16:10 ratio. Which again makes it not so ideal for gaming especially if you capture footage, you'll end up with black bars on the edges of your videos. The Dell monitor was picked up at an insane price, and was added as a second screen for web page viewing and system information displaying while in-game. The colors are beautiful and the flexibility is very nice. The only complaint, is that there is no HDMI input. You either have to use DVI, or DISPLAYPORT. 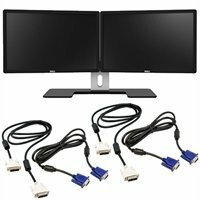 I used DVI, as DISPLAYPORT cables are impossible to find in brick and mortar stores. Because the graphics card firing order sends the DVI signal first, this second monitor boots up first. Not really a big deal, unless I have to get into the BIOS. The BIOS displays in landscape mode, and this monitor is set to portrait, so I have to crane my neck to use it. Kind of a pain, but still a nice monitor. The Dell Monitor is a great 1920x1200 monitor. The colors are gorgeous, and the little extra height allowed me to put the screen in portrait mode and use it like two mini-monitors. Good enough specs for gaming, but it really shines for me being used for webpage viewing and videos. I got a great deal on it when I was on the market for something inexpensive, and think it would be a good deal, even at retail. It was too good a deal to pass up, and I am very happy with it.